at 200 worldwide locations, and has co-authored 250 dental articles. The question that remains is, how do we debride that remaining approximately 40% of the canal surface that has not been cleaned by instrumentation? The answer is irrigation: What do we use, and when do we use it for optimal debridement and disinfection? This is the concern of this article. If instrumentation were 100% effective in removing all bacteria and debris from the canal, irrigation would be an insignificant adjunct to mechanical debridement. We would irrigate only to lubricate and facilitate canal instrumentation. Unfortunately, this is not the case. There are many studies that show the limited ability of instrumentation alone to debride and clean the canal.1-5 Wu and Wesselink6 reported uninstrumented areas in 65% of instrumented oval canals. Rödig et al7 studied nickel-titanium (Ni-Ti) rotary instrumentation of buccal and lingual extensions of oval canals and found inadequate controlled debridement. It seems from the literature that most rotary instrumentation systems do an adequate job in shaping the canal but a poor job when it comes to debridement and cleaning of the canal. No instrumentation technique comes close to sterilization of the canal. The question that remains is, how do we debride that remaining approximately 40% of the canal surface that has not been cleaned by instrumentation? The answer is irrigation: What do we use, and when do we use it for optimal debridement and disinfection? This is the concern of this article. Currently, there are 3 main categories of irrigants: lubricants, disinfectants, and chelating agents. Lubricants are used to make instrumentation easier. They reduce the friction between the endodontic instrument and the canal wall. Removing dentin by either hand instrumentation or mechanical instrumentation becomes much easier if the canal is wet or lubricated. Instrument lubrication can be achieved easily by using either sterile water, saline, or sodium hypochlorite (NaOCl) for most routine cases. These are readily available and inexpensive. There are also many commercial products currently being sold on the market today specifically for use as instrumentation lubricants. Most are some form of 17% ethylenediaminetetraacetic acid (EDTA) in liquid, gel, or paste formulations. Clinically, I have not found that any particular physical phase of the EDTA makes it a more effective lubricant than any other. However, only liquid 17% EDTA is easy to get into the canal, coats all the walls, and is easy to get out of the canal when I am finished using it. Therefore, I prefer 17% EDTA Plus (Essential Dental Systems) in water for use as a lubricant when instrumenting tight canals because it contains a surfactant which enables the EDTA to wet the canal walls more easily (Figure 1). Figure 1. Commercial 17% ethylenediaminetetraacetic acid (EDTA) in aqueous solution for endodontic use. it kills bacteria quite effectively. In water, NaOCl ionizes to produce Na+, hypochlorite (OCl) and hypochlorous acid (HOCl). HOCl is the active moiety responsible for bacterial inactivation.12 The hypochlorous acid must be in direct contact with the bacteria in order to damage the membrane and kill the bacteria. Direct contact with bacteria and flow of the hypochlorite into the apical area is often quite difficult in canals that are not instrumented to wider apical diameters. Boutsioukis et al13,14 have demonstrated that root canal enlargement to greater than a size 25 appears to improve the performance of syringe irrigation. They also noted that increase tapering (.06) improved irrigant replacement. It has been shown that the presence of dentine caused delays in the killing of Enterocococcus faecalis using 1% NaOCl.15 In addition, E faecalis has been demonstrated to be more resistant to killing by NaOCl than Candidia albicans and Gramnegative rods.16-18 E faecalis has also been found to be present in many failed endodontic treatments. It would seem that the longer the hypochlorite is in contact with the bacteria and tissue, the better the outcome. Stojicic et al19 reported that dissolution of tissue increased almost linearly with the concentration of NaOCl. They also reported that higher temperatures and agitation considerably enhanced the efficacy of NaOCl. The effect of agitation on tissue dissolution was greater than that of temperature. However, it has been reported by Sirtes20 that there is a 100-fold increase in killing efficacy between corresponding NaOCl solutions at 20°C and 45ºC (113ºF). Preheating NaOCl solutions appears to improve their necrotic pulp tissue dissolution capacity and efficacy against E faecalis cells. Al-Jadaa et al,21 in simulated curved canals, showed that passive ultrasonic irrigation (PUI) with a Ni-Ti tip promoted superior tissuedissolving ability than sonic irrigant activation while maintaining canal anatomy. In order to take full advantage of the physical properties of NaOCl, I both heat it and use PUI to activate it. Brito et al22 tested the efficacy for killing E faecalis in vitro when using 3 different irrigation techniques. The researchers used conventional irrigation with NaviTip needles (Ultradent Products), conventional irrigation with NaviTip needles and activation with the EndoActivator (DENTSPLY Tulsa); then lastly, irrigation with the EndoVac system (Discus Dental). The EndoVac system is an apical negative pressure irrigation system. Brito et al22 found that, of any one of the irrigation techniques evaluated in their in vitro model, there was no evident antibacterial superiority. Keeping these research facts in mind, the question then becomes: How do we formulate our endodontic irrigating protocol to make maximum use of the physical properties of NaOCl? The majority of my instrumentation is done using warmed 6% NaOCl as the irrigant. I place NaOCl in the canal using a drop-by-drop method (Figure 2). It is the chemical action of the NaOCl that does the work, not the washing of the canal with the irrigant. Drop by drop placement in the canal greatly reduces the risk of any hypochlorite accidents. This problem occurs when the hypochlorite is extruded past the apex and into the surrounding tissue. I also fill the entire access cavity with NaOCl (Figure 3). As the endodontic instrument is placed into the access cavity and then into the canal, it drags along some of the irrigant via capillary action into the canal. The hypochlorite in the access cavity and in the canal will also act as a lubricant that will facilitate easier instrumentation. Figure 2. Drop by drop delivery of sodium hypochlorite (NaOCl) using a 30gauge needle. Figure 3. 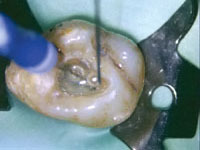 A molar access cavity filled with NaOCl during instrumentation. I use a syringe heater (Vista) to heat my hypochlorite. The syringe heater warms the solution to approximately 130°F. After complete instrumentation, I agitate each canal with an ultrasonic tip for approximately one minute. The literature currently does not point to any one form of agitation as being superior to any other. However, any type of agitation of the NaOCl is far better than none! I place a smalldiameter ultrasonic tip in the canal (Figure 4) and leave it in the middle of the canal, trying not to touch the walls of the canal. The purpose is just to agitate the irrigant, not to instrument or enlarge the canal. I activate the tip and leave it in place for approximately one minute per canal. As the NaOCl in the access cavity gets cloudy with dissolved tissue and debris, it is less effective. Make sure to change the hypochlorite often during the irrigating and agitation procedures. I refresh the NaOCl between each instrument size change. The hypochlorite should be replaced if there is no distinctive hypochlorite odor or slightly greenish color to the solution. If the solution is clear, it is no longer effective and should also be replaced. Figure 4. An ultrasonic tip in the canal for passive ultrasonic instrumentation to activate the hypochlorite. Figure 5. Bacteria on the canal wall and inside the dentinal tubules. Figure 6. 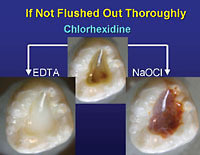 A commercial example of FDA cleared 2% chlorhexidine (CHX) for endodontic use. Figure 7. Demonstration of precipitates formed with 2% CHX. Currently, the effect of these precipitates to the longterm outcome of the endodontic procedure is unknown. Therefore, it is best to not form them at all. Before applying the CHX to the canal, I rinse the canal with either sterile water or anesthetic solution. This will wash the EDTA or NaOCl out of the canal and chamber and stop the precipitate from forming when the CHX is used in the tooth. CHX also demonstrates the property of substantivity. That is, it remains antibacterial for several weeks after it is placed in the canal.29-31 I irrigate the canals with CHX just before obturation and use an epoxy root canal sealer (EZFill [Essential Dental Systems]) because epoxies will set underwater. I do not dry the canal completely, but rather I allow the canal to remain damp with CHX. This does not affect any of the physical properties including the set of the sealer. However, it does create an environment in the canal in which the substantivity of the CHX can have an antibacterial effect for many weeks after the procedure. We need all the help we can get to get rid of those bugs! The last category of root canal irrigants is chelating agents. Chelants are chemicals that form soluble complex molecules with certain metal ions, inactivating the ions so that they cannot normally react with other elements or ions to produce precipitates or scale. In dentistry, chelating agents bind with calcium and carry it out of the canal. 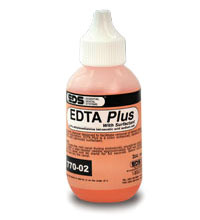 The chelating agent most used in endodontics is EDTA. The smear layer, which covers the dentinal tubules, is created during the instrumentation procedure and is composed of dentin, liquid from the irrigants, and tissue debris (Figure 8). Removal of the smear layer from the root canal wall is a key step in endodontics. We would like to remove the smear layer and expose the dentinal tubules for 2 reasons (Figure 9). One reason is to allow the endodontic sealer to penetrate into the tubules for a more intimate fit, hopefully better sealing of the canal. Secondly, by removing the smear layer, and consequently opening up the tubules, we can expose the bacteria that are living there and causing apical periodontitis. Once exposed, the bacteria are susceptible to the disinfecting irrigants we use. Figure 8. Smear layer on the canal wall occluding the dentinal tubules. Figure 9. Smear layer removed with 17% EDTA showing open and patent dentinal tubules. All these irrigants must be able to come into direct contact with the bacteria in order to kill them. If the smear layer is intact, it is impossible for either NaOCl or CHX or any other material to come in direct contact with the bacteria or biofilm. The next question then becomes: How long do we leave the EDTA in contact with the canal to remove the smear layer? Teixeira et al32 showed that EDTA irrigation for one, 3, and 5 minutes were equally as effective in removing the smear layer. Crumpton et al33 showed efficient removal of the smear layer with a final rinse of one mL of 17% EDTA for one minute. Therefore, I use 17% aqueous EDTA for at least one minute in each canal, and I also activate the EDTA by using PUI. Now that we understand the irrigants, their physical properties, and optimum usage, what is the actual procedure in clinical practice? I try to use the same irrigating protocol for every patient. This makes it easier for my assistant, which in turn makes it easier for our patient and me. I use the SafeSider system for instrumentation. This is a system of relieved reamers both stainless steel and Ni-Ti that are used in a reciprocating handpiece. Reciprocation greatly reduces the risk of instrument breakage in the canal.34,35 Most canals are finished to either a 30 or 35 at the apex with a .06 taper. During the first part of SafeSider instrumentation when the stainless steel instruments are employed, NaOCl is used as the irrigant (Figure 10). It is placed drop by drop into the canal, and the access cavity is also flooded. The NaOCl is replenished between each instrument change, or if it becomes cloudy during instrumentation. We use NaOCl from the number 08 stainless reamer up to the number 40 stainless reamer. Generally, this will keep the canal soaked in hypochlorite for at least 30 minutes in a molar. When I use the Ni-Ti instruments to create the taper, we switch to 17% EDTA in water as our irrigant. Since I use 2 Ni-Ti instruments (30/.04 and 25/.06), the EDTA is usually in the canal for more than one minute. This step lets me remove the smear layer. When I finish with the last Ni-Ti instrument, I use PUI for approximately one minute in each canal filled with EDTA. Now that instrumentation is completed, and the smear layer has been removed, I place NaOCl in the canals and once again use PUI to activate it. I leave the ultrasonic tip in each canal for one minute. This helps remove any excess tissue located in any canal evaginations or outpocketings. If this was a vital tooth, it is now dried and obturated. If it was a nonvital tooth, including endodontic redos, it is rinsed with saline or anesthetic solution to flush out any remaining hypochlorite in the canal and then irrigated with 2% CHX. The 2% CHX is left in the canal for 2 minutes. The canal is then partially dried but left somewhat damp. This makes use of the substantivity effect of the CHX. We use EZFill sealer, which is an epoxy cement, and gutta-percha for obturation. The epoxy cements can set under water; therefore, if the canal is slightly damp with CHX it will not affect the set or other physical properties of the EZFill sealer. Figure 10. Timeline for irrigation use during endodontic therapy. Currently, there is no ideal irrigant for endodontic use. All have their good and bad characteristics. Taking into account the proper sequence of use and physical characteristics of the current selection of irrigants will greatly enhance their effectiveness in treatment. Heating and activation of these irrigants with either sonic or ultrasonic energy will also greatly improve their efficacy in clinical use. Successful treatment in endodontics is both heavily reliant on instrumentation and irrigation. Hülsmann M, Stryga F. Comparison of root canal preparation using different automated devices and hand instrumentation. J Endod. 1993;19:141145. Hülsmann M, Schade M, Schäfers F. A comparative study of root canal preparation with HERO 642 and Quantec SC rotary NiTi instruments. Int Endod J. 2001;34:538546. Hülsmann M, Gressmann G, Schäfers F. A comparative study of root canal preparation using FlexMaster and HERO 642 rotary NiTi instruments. Int Endod J. 2003;36:358366. Hülsmann M, Herbst U, Schäfers F. Comparative study of root canal preparation using Lightspeed and Quantec SC rotary NiTi instruments. Int Endod J. 2003;36:748756. Wu MK, Wesselink PR. A primary observation on the preparation and obturation of oval canals. Int Endod J. 2001;34:137141. Rödig T, Hülsmann M, Mühge M, et al. Quality of preparation of oval distal root canals in mandibular molars using nickeltitanium instruments. Int Endod J. 2002;35:919928. Peters OA, Laib A, Göhring TN, et al. Changes in root canal geometry after preparation assessed by highresolution computed tomography. J Endod. 2001;27:16. Peters OA, Peters CI, Schönenberger K, et al. ProTaper rotary root canal preparation: assessment of torque and force in relation to canal anatomy. Int Endod J. 2003;36:9399. Vaudt J, Bitter K, Kielbassa A. Evaluation of Rotary root canal Instruments in vitro: a review. Endo. 2007;1:189203. Sherman L and Sultan P. Comparison of surface ductal states between a mechanized system and various NiTi Systems. Le Chirurgien Dentiste de France. 2009;1411:4756. Trope M. Infection Control Through Root Canal Preparation: A Review of Cleaning and Shaping Procedures. Endodontic Topics. 2005;10:80102. Boutsioukis C, Gogos C, Verhaagen B, et al. The effect of apical preparation size on irrigant flow in root canals evaluated using an unsteady Computational Fluid Dynamics model. Int Endod J. 2010;43:874881. Boutsioukis C, Gogos C, Verhaagen B, et al. The effect of root canal taper on the irrigant flow: evaluation using an unsteady Computational Fluid Dynamics model. Int Endod J. 2010;43:909916. Haapasalo HK, Sirén EK, Waltimo TM, et al. Inactivation of local root canal medicaments by dentine: an in vitro study. Int Endod J. 2000;33:126131. Waltimo TM, Orstavik D, Sirén EK, et al. In vitro susceptibility of Candida albicans to four disinfectants and their combinations. Int Endod J. 1999;32:421429. Radcliffe CE, Potouridou L, Qureshi R, et al. Antimicrobial activity of varying concentrations of sodium hypochlorite on the endodontic microorganisms Actinomyces israelii, A. naeslundii, Candida albicans and Enterococcus faecalis. Int Endod J. 2004;37:438446. Gomes BP, Ferraz CC, Vianna ME, et al. In vitro antimicrobial activity of several concentrations of sodium hypochlorite and chlorhexidine gluconate in the elimination of Enterococcus faecalis. Int Endod J. 2001;34:424428. Stojicic S, Zivkovic S, Qian W, et al. Tissue dissolution by sodium hypochlorite: effect of concentration, temperature, agitation, and surfactant. J Endod. 2010;36:15581562. Sirtes G, Waltimo T, Schaetzle M, et al. The effects of temperature on sodium hypochlorite shortterm stability, pulp dissolution capacity, and antimicrobial efficacy. J Endod. 2005;31:669671. AlJadaa A, Paqué F, Attin T, et al. Acoustic hypochlorite activation in simulated curved canals. J Endod. 2009;35:14081411. Brito PR, Souza LC, Machado de Oliveira JC, et al. Comparison of the effectiveness of three irrigation techniques in reducing intracanal Enterococcus faecalis populations: an in vitro study. J Endod. 2009;35:14221427. Stuart CH, Schwartz SA, Beeson TJ, et al. Enterococcus faecalis: its role in root canal treatment failure and current concepts in retreatment. J Endod. 2006;32:9398. Vianna ME, Gomes BP, Berber VB, et al. In vitro evaluation of the antimicrobial activity of chlorhexidine and sodium hypochlorite. Oral Surg Oral Med Oral Pathol Oral Radiol Endod. 2004;97:7984. Russell AD, Day MJ. Antibacterial activity of chlorhexidine. J Hosp Infect. 1993;25:229238. Rasimick BJ, Nekich M, Hladek MM, et al. Interaction between chlorhexidine digluconate and EDTA. J Endod. 2008;34:15211523. Basrani BR, Manek S, Sodhi RN, et al. Interaction between sodium hypochlorite and chlorhexidine gluconate. J Endod. 2007;33:966969. Bui TB, Baumgartner JC, Mitchell JC. Evaluation of the interaction between sodium hypochlorite and chlorhexidine gluconate and its effect on root dentin. J Endod. 2008;34:181185. Mohammadi Z, Abbott PV. Antimicrobial substantivity of root canal irrigants and medicaments: a review. Aust Endod J. 2009;35:131139. Khademi AA, Mohammadi Z, Havaee A. Evaluation of the antibacterial substantivity of several intracanal agents. Aust Endod J. 2006;32:112115. Rasimick BJ, Shah RP, Musikant BL, et al. Bacterial colonization of root canal dentine previously treated with endodontic irrigants. Aust Endod J. 2010;36:7073. Teixeira CS, Felippe MC, Felippe WT. The effect of application time of EDTA and NaOCl on intracanal smear layer removal: an SEM analysis. Int Endod J. 2005;38:285290. Crumpton BJ, Goodell GG, McClanahan SB. Effects on smear layer and debris removal with varying volumes of 17% REDTA after rotary instrumentation. J Endod. 2005;31:536538. Wan J, Rasimick BJ, Musikant BL, et al. A comparison of cyclic fatigue resistance in reciprocating and rotary nickeltitanium instruments. Aust Endod J. In press. DeDeus G, Moreira EJ, Lopes HP, et al. Extended cyclic fatigue life of F2 ProTaper instruments used in reciprocating movement. Int Endod J. 2010;43:10631068. Dr. Deutsch is an assistant clinical professor of endodontics at Columbia School of Dental Medicine, codirector of dental research, and cofounder of Essential Dental Systems. Dr. Deutsch cooperates an endodontic practice in New York City. He holds 19 patents for coinventing revolutionary endodontic products. He is one of the leading authorities in endodontics, having lectured at more than 200 worldwide locations, and has co-authored more than 250 dental articles. Disclosure: Dr. Deutsch is executive vice president and codirector of dental research for Essential Dental Systems (EDS). Some products mentioned in this article are manufactured by EDS.